Wow!I didn't realize that so much time has slipped by! August has been a wonderfully busy month filled with canning garden produce, painting, vacation and family visits from folks out of town. The pace has not slowed down now for several weeks and I'm looking forward to cooler temperatures and a little relaxation! Here is one of the commissions I had the honor to paint this month. 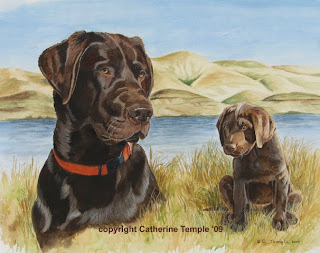 This is another of my "Past to Present" paintings featuring Rico, the Chocolate Lab, as a puppy and young adult. 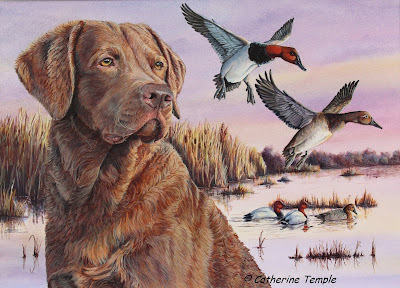 He really is a gorgeous boy and has a rich, dark chocolate color, hence the name of this painting. Rico may be a sporting breed, but his owner doesn't hunt. However, they love to play in the rivers near their home so we put some of the local scenery in the painting. Well, I'm off to prepare for out of town guests. Hope everyone's summer has been wonderful! See you soon!